Dalton State officially announced on Wednesday that Saif Alsafeer has agreed to become the Director of Soccer. Alsafeer will lead both the men's and women's teams. "What a great day for Dalton State," said Interim Chief of Staff Jon Jaudon. "Coach Alsafeer brings excellence to every area we desire. Most of all he will contribute to the development of the total person under his care. I could not be happier that Saif accepted our offer to lead Roadrunner soccer." Alsafeer comes to Dalton State from his alma mater, Florida College, where he spent the past five years leading the Falcons men's team. A new member of the SSAC in 2018, the Falcons finished (11-2-4, 5-2-1 SSAC) and placed third in the regular season standings. The stellar season landed him the 2018 SSAC Coach of the Year award. "My wife and I are very excited to become a part of the Dalton State family," Alsafeer said. "The atmosphere in athletics and amongst the administrative team on campus is outstanding. I want to thank Mr. Jaudon for having the confidence in me to build a strong future for Dalton State Soccer on campus and in the Dalton community. I'd also like to thank Dr. Venable, Dr. Chute, Dr. Johnson, and the entire athletic staff for their trust and the warm welcome they've displayed for Sarah and our young family. We look forward to developing young student-athletes at Dalton State to reach their potential in all aspects of life." In his five years guiding the Falcons, Alsafeer accumulated a 66-16-4 record including two undefeated regular seasons (12-0 in 2017 and 14-0 in 2016). His 2017 squad scored a program best 72 goals, while allowing only three. He earned 2017 USCAA Coach of the Year as a result. Alsafeer has produced 12 Academic All-Americans, 10 All-Americans, and four USCAA All-Tournament team players. In addition to coaching Florida College, he was the head coach and general manager of the Tampa Bay Marauders Football Club of the CSL-USA from ('16-'18). 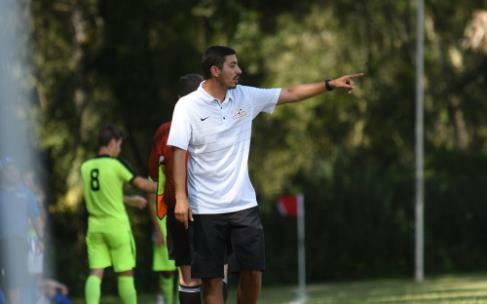 He also previously coached the U-16 Tampa Dynamo Soccer Club. Before becoming a coach, Alsafeer was a four-year starter and captain for Florida College ('09-'12) and played semi-professionally for the Tampa Bay Marauders Football Club. During his time as a player for the Falcons he was a three-time USCAA Academic All-American and a three-time USCAA First Team All-American. He led Florida College to a USCAA Final Four appearance in 2011. With Tampa Bay FC, he was a First Team member while helping the Marauders to two Gulf Coast Cup championships. Alsafeer earned his Bachelor of Science degree in Elementary Education from Florida College in 2013. In December of 2018, he completed his Master of Science degree in Soccer Coaching Education from Ohio University. The degree is the only one of its kind in the United States. He and his wife Sarah have one daughter, Leila (2), and are expecting their second daughter, Jordan, any day now.